It was an inspiring and historical collaboration between top notch Pianist Katelyn Bouska and the extraordinary hands of cellist Štěpán Filípek. The performance was to commemorate the anniversary of the 100th anniversary of the Czechoslovak Republic and its support for American compatriots and societies. The inspiring event was held at the Atrium Žižkov on Friday 23rd March 2018. The performance also featured the composition of Cello Sonata for Cello S. Barbera in confrontation with the intimate Fairytales for cello and piano by L. Janáček. Katelyn Bouska met cellist Štěpán Filípek in Brno during the summer of 2015 when she visited the Czech Republic to look for areas of collaboration with Czech composers. This meeting gave birth to to sharing knowledge of the Czech and American music environments which resulted to joint concerts in Brno and Philadelphia with lots of great studio recordings. The event witnessed representative from the U.S. Embassy in The Czech Republic, notable personality with friends and family members of the music performers. It was a wonderful experience with the great musical icons. More interviews and videos expected on this platform. With performances described as “musically evocative” and a skill at engaging audiences in the musical dialogue, Dr. Katelyn Bouska is a frequent solo and collaborative musician. Her unique programming combining rarely-heard Czech and American music with music being written specifically for her by rising composers has found an audience throughout America and on the international concert stage in France, Canada, Austria, Italy, Germany, the Czech and lots more. According to Curtis Institute of Music, Dr. Bouska is in demand as a teacher. She holds a D.M.A. in piano performance, master’s degrees in piano pedagogy and harpsichord performance, and a professional studies certificate in chamber music, all from Temple University; and a bachelor’s degree in piano performance from Viterbo University. Dr. Bouska joined the Curtis faculty in 2016. Štěpán studied at Prague Conservatory, Brno Conservatory and the Janáček Academy of Music and Performing Arts. Since 2007 he is a cellist of the Orchestra of the National Theatre in Brno. He has started his professional career as interpreter of contemporary classical music, he has performed for example with Orchestra Berg, Ensemble Recherche, or the BCO and others. He has performed solo concerti with Pilsen philharmonic and Moravian philharmonic Olomouc. Make the best use of this season to get your eyes tested…..
What is the first sign of glaucoma? Chiggy Chidinma writes further….Glaucoma is a silent thief of sight. The type rampant in Nigeria and Sub-Saharan Africa is Primary Open Angle Glaucoma. It gives you no sign, it gives you no symptoms. Doctors are trained by practice and experience to find out early for proper management. Damages caused by Glaucoma are irreversible. Drugs and Surgeries are only used for management of the Eye (s) involved. God bless you Ireti Emmanuel Adesida. Thanks for joining your voice with ours. Blindness is a scourge! Thanks to @djsuccessformula – 10 Daily Habits of Successful Entrepreneurs: create a routine, track your progress, and continue learning. What’s your view? …..Let’s talk…..
Termites play a major role in nourishing the soil and have a symbiotic relationship with big trees in the forest though they’re unaccepted guests in a domestic environment…. The bottom line is that a lot of organisations will be affected…. Cooperatives (Ajo , Esusu etc), Student Association, Alumni, Youth Organizations, Religious organizations, Clubs, Development initiatives etc…. This Bill seeks to constitute a new Government body with full powers to control Community Based Organisations, Civil Societies and Ngos; by implication this bill will give this body unlimited power to exert undue influence on churches. Organisations who do not meet up with whatever future policies they constitute will not be ‘revalidated’ (revalidation is proposed to hold every 2years) This bill is a morphed version of an effort earlier in January to negate church operations . We seek to stop this Bill because it will affect the operations of churches and the freedom to worship as guaranteed in the constitution of the country. The Bill is meant to handicap NGOs and make the voluntary purpose of Community development invalid …..
Will you sign this petition? The importance of open data in agricultural development cannot be overemphasised. GODAN has been able to develop a sustainable data platform in addressing various challenges in data gathering and usage with the Agriculture Open Data Package. Empowering the farmer. Farmers (and especially smallholders) often have less access to information than other specialist actors. Optimizing agricultural practice. Government extension services possess a lot of data on agricultural best practices. Stimulating rural finance. The price of financial services for farmers is strongly dependent on the assumed risks by financial institutions. Facilitating the agri value chain. Actors in one part of the value chain need to know about performance in other parts of the value chain in order to make decisions such as who to do business with, or how to comply with the quality standards in different markets. Enforcing policies. Many regulations result in lists of items or organisations that are permitted, licensed, restricted or forbidden. Government transparency and efficiency. Donors, policymakers, beneficiaries, and civil society require data on government spending in the agricultural sector to promote more efficient decision-making, equity and prevent corruption. 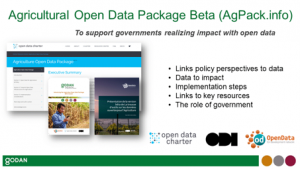 Add your comments on the beta version of the Agriculture Open Data Package (available at http://www.agpack.info/). Adopt the international Open Data Charter. Become a champion of the Agriculture Open Data Package, and be involved in shaping future versions of the resource. infrastructure, define your policy areas, and plan your open agriculture data strategy. 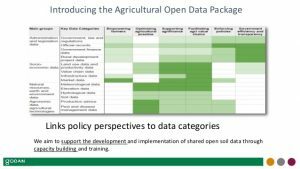 Prioritise relevant government agriculture data for release based on the 14 recommended data categories and sample datasets contained within the Package. Contribute your use cases to the Package. Send comments and use cases to enquiries@godan.info. Feedback on this document can also be made via the Open Data Charter Resource Centre. The GODAN Secretariat and network can provide support to governments that are working to put the package into practice. I had the great opportunity to meet my #grand #mentor He mentored my supportive father in the area of #journalism. He is over 90 years but very energetic with up-to-date grasp of the media/communication world. He was also the founding editor of Good News #magazine in the UK. That’s the secret of my expertise in #communication issues….. It’s an additional lesson for my mentorship platform….. What about you? The leadership lesson….. What are you holding on to? The famous actor Arnold Schwarzenegger posted a picture of him sleeping in the street under his famous bronze statue, and wrote sadly (How times changed). The reason he wrote the sentence was not only because he was old, but because when the governor of California opened the hotel with the statue in front of him. The hotel officials told Arnold: “At any time you can come and have a room reserved in your name”. The reality of life came in when Arnold left Government and went to the hotel, the administration refused to give him a room arguing that the hotel was fully booked. Though he could afford other hotels but he wanted leaders to learn a great lesson. He brought a cover and slept under the statue and asked people to imagine it. He wants to convey a message that when he was in a position they were praising him, and when he lost this position they forgot and did not fulfill their promise to him. Yes, times have changed. Copyright © 2017 Ireti Adesida - Powered By: JafxNet.